Why Is Your Senior Paranoid? When your senior starts to show mistrust of you or other people she used to trust, she might be experiencing paranoia. Paranoia can also make her respond as if she’s in some sort of danger, even if she’s perfectly safe. But what’s causing it? Brain tumors, Alzheimer’s disease, and other types of brain injuries or problems can change how her brain operates. That means that the information that she takes in isn’t processed the same way that it used to be, which can result in some odd changes. Those interpretations now seem very real for her, which leads to the paranoia you’re seeing. Some mental health issues like depression or schizophrenia show up later in life. If your senior has a family history of these types of disorders, she might have a greater chance of seeing them develop. Sometimes these disorders can develop after a traumatic situation or illness. 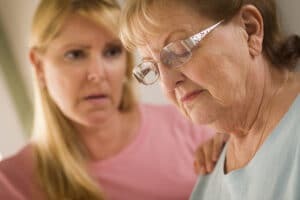 If you suspect that your elderly family member is dealing with a psychiatric issue, she needs to be evaluated as soon as possible. Medication side effects can pile on top of each other and make things worse rather than better. This can even happen with medications that your aging family member has taken for years. Make it a point to ask for a medication review every few months just to make sure that all is well with the medications that your elderly family member takes. When blood flow temporarily stops, so too does oxygen. That’s because red blood cells carry the oxygen throughout your senior’s body and to her brain. But if she has some sort of circulatory damage or injury that halts or slows down her blood flow, even temporarily, this can be a cause of paranoia. Bladder infections look a lot different for your senior now than they did when she was younger. She may still experience pain while urinating, but she can also experience changes in her behavior and mental changes, such as paranoia. Treating the UTI often corrects the other issues, but you’ll need to learn these new symptoms so that you can spot bladder infections more quickly in the future. Dealing with paranoia can be scary for you and for your aging adult. If the underlying issue is treatable, elder care providers can help your senior to get back on her feet again. In cases where the underlying issue is progressive, elder care providers can also help you to cope with this new normal that you’re facing. The staff at Home Care Matters is available to talk with you and your family about all of your needs. Home Care Matters is a home care agency providing quality and affordable elder care in Buford, GA and the surrounding areas. Call (678) 828-2195 for more information. Valerie Darling is the founder & owner of Home Care Matters. It was through Valerie’s own personal experience of caring for her mother, Dee Darling, for 5 yrs that the business was born. Valerie has 30 yrs of Corporate experience with Fortune 100-500 companies in Sales, Customer Service, & Senior Management. She has taken that professional experience along with a personal vision of how to provide a better experience, service & quality of care. She determined that the best way to do this was to start a local, community-based business that is personalized, customized, with heart-felt care & a passion for people (both clients & caregivers) & is obsessed with service. ‘Our goal is to have clients stay independent in their own homes, where they are happiest, by providing a safe, nurturing, & safe environment.’ Valerie’s mom Dee laid expectations for her own personal caregivers, and we provide the same expectations for your family. "If we wouldn’t want them caring for our mom, then we’re not placing them with yours". We are firm believers in personality compatibility along with the skill requirements for a personal placement & we hire based upon that rather than just a ‘warm body’.